The quiet village and parish of Bucklebury is now well known as the childhood home of Kate Middleton, the Duchess of Cambridge. Set in the beautiful English countryside with views of the deer park as you drive in, the village sits 5 miles north-east of Newbury and is referenced in a charter of 956 AD. During Norman times, the village was part of the royal hunting ground, Roman dwellings have been found within the Parish and the remains of a bronze age fort have been found. Bucklebury sits on the banks of the River Pang and has remained small due to frequently high water levels. As a result, the village expanded into Upper Bucklebury which became the parish’s larger residential area situated on a hill 2.4 km south-west of Bucklebury village. The Bladebone Inn in nearby Chapel Row appeared in the 1851 census and is still open as a pub and restaurant today. The large copper sign at the front of the pub apparently encases the bladebone of a mammoth found locally in the 17th century, hence the pub’s name. We recommend it after enjoying a nice pint there! The Old Boot Inn, an 18th century free house in Stanford Dingley, is rumoured to be where Kate and William sometimes enjoy a quiet drink. 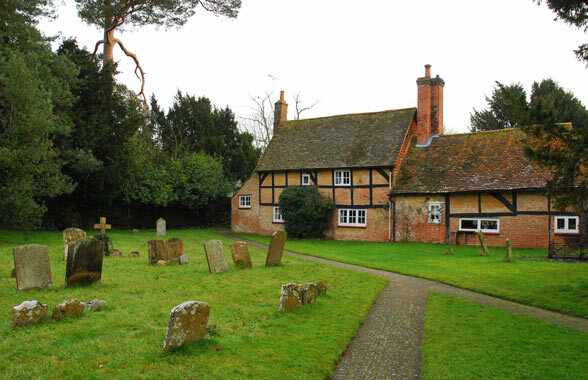 The parish church of St Mary the Virgin in the centre of Bucklebury is a grade 1 listed building dating back to the 11th century and the manor was held by Edward the Confessor until his death in 1066 . The church features the remains of a ‘squint’ which allowed the behaviour of the congregation to be viewed. A number of the beautiful stained glass windows are by Sir Frank Brangwyn (1867-1956). The South doorway is Norman and is dated between 1150 and 1170. The churchyard features some interesting altar tombs and old wooden graves. Bucklebury Farm Park can be found on the outskirts of the village and offers visitors the chance to see around 150 wild deer in the deer park set in magnificent grounds. The park also has an adventure playground, picnic area, refreshments, animal feeding and free tractor trailer rides. Opening hours are seasonal so check their website for full details.